Happy 2012, everyone! I hope everyone had a great weekend, and now of course it's time to buckle down with your resolutions. Lose weight. Get more organized. Save more money. The usual, right? I'm actually not really big into resolutions, per se, but I do think it's important to set goals. And did you know that you are 60% more likely to reach your goals if you write them down? I totally made up that statistic, but the sentiment is true. I find that writing down specific, tangible goals definitely makes a big difference, versus just having vague ideas of things I want to achieve. So anyway, if you made the resoltion/goal to eat healthier, eat more dinners at home, eat more veggies, and/or cook more, then this soup is a great place to start. It is healthy, tasty, filling, and perhaps most importantly, it's on the table in under 30 minutes. This particular version uses a combination of carrots, onions, celery, mushrooms, and zucchini, but I think pretty much any combination of veggies would work. This would be a great soup to make when you're trying to clean out the veggie drawer in your fridge. It also calls for cannellini beans, but again, I think several other varieties would be just as good. If you need some healthy inspiration, I've updated my Featured Recipes page to showcase some of my favorite healthy dinners. Heat the olive oil in a large Dutch oven over medium heat. Stir in the carrots, celery, and onions,1/4 teaspoon of salt, and black pepper to taste, and cook until just softened, 3-5 minutes. Stir in the mushrooms, and cook until all the vegetables are softened, 5-6 more minutes. Add the garlic and oregano and cook until fragrant, about 30 seconds. Stir in the broth, scraping up any browned bits. Stir in the vegetable juice and beans and bring to a boil. Reduce the heat to a simmer and cook about 10 minutes. Add the tortellini and zucchini and continue to simmer until they are cooked through and tender, 5-7 minutes. Season with salt and pepper to taste. Divide among serving bowls and top each portion with a spoonful of pesto and a sprinkling of Parmesan before serving. This looks warm, homey, and delicious. . . . It's the perfect time of year for cozy soups like this! 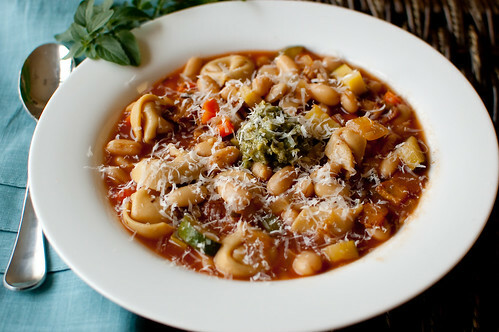 Minestrone is a personal fave of mine - love the addition of tortellini! I've been craving tortellini like a mad woman lately. This post just about sent me over the edge. lol. :) Looks delicious. This soup looks so comforting! I love the idea of tortellini in soup and I really want to try this! Italian comfort but healthy. Love it! Eating more veggies is definitely on my list, thanks for a great idea! I posted a Minestrone soup today too! But I think I really love the idea of using cheese tortellini for the pasta!! Hi Josie, Made this tonight as a healthy complement to the leftover-ham sanwiches we were having for dinner. Delicious and easy! Thanks for the recipe! I made this last night - what a hit! Thanks. I made this a few nights ago and it was delicious. Thank you! Hi Josie, I'm prepping freezer meals in preparation for our baby girl's arrival in a few weeks! 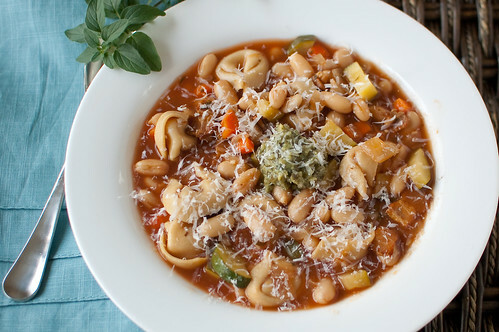 This minestrone looks like a perfect addition to our post-baby meals, but I was wondering if you think it would freeze well or if the quality would be diminished? Thanks for any tips/advice you have!! Normally, I think soups freeze really well, but the tortellini in this one makes me wonder. I would maybe make it and then just not add the tortellini yet. And when you're ready to thaw and heat, add the tortellini to the pot then. That way it will stay fresh and not get too mushy. Does that make sense? Yes, makes sense! Fresh tortellini would taste better with minimal effort at the time. Thank you! Kristin, let me know how it turns out! I'd love to know for future reference! And congrats and on the new baby - girls are so much fun!! Made this for dinner last night and it was yummy! I love how quickly it came together without compromising flavor. Great for a weeknight meal! The only changes I made were using tomato juice instead of V8 (because my husband bought it thinking they were the same thing! It seemed to have worked out fine though.) and I went ahead and stirred the pesto right into the soup pot rather than adding it to each individual serving.